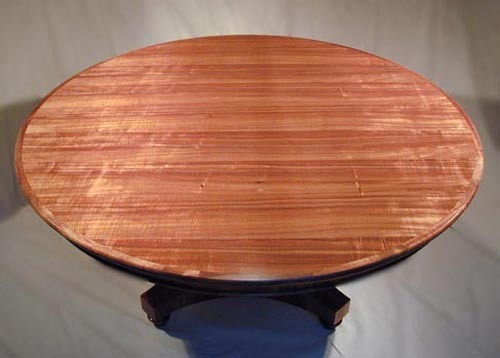 This 5'-6" diameter center/dining table, made of 1/8" thick shop cut curly Koa veneer and solid turned center pedestal with reeding is from a 100 year old West Indies Mahogany tree that grew on Kalakaua Avenue in Waikiki. The preferred Mahogany (West Indies Mahogany) of early American furniture makers are very rare and commercially unavailable today. 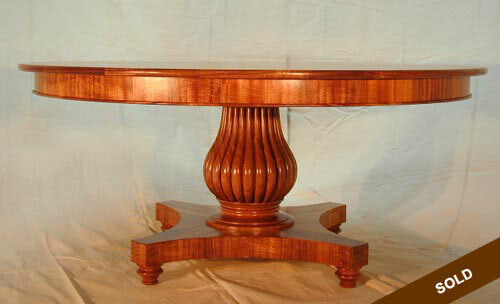 Above shows the fine curly Koa veneer used in these tables.